Under each product, there is a combo box for both Windows and Mac which each contain a list of older releases. Simply select one and your browser will begin the download. This is great, but I can only see Xamarin Studio on my account page, there are no dropdown boxes for Xamarin.Android, Xamarin.iOS, or Xamarin Mac. How do we download these if they don't appear? I am on a trial, and am having all sorts of problems with the latest version of Xamarin.Android (4.10.1) on Visual Studio, and can't find how to install the previous version. So I am stuck. Help please. @RT: older versions are only shown for customers who have purchased them. If you're having problems with your trial and need an older version I suggest you email support. I want to take trial of Xamarin and what I have is MacBook with 10.6.3 OS. Is there any way so that I can install Xamarin studio on it? No, you need at least OS X 10.8 to even install a current version of Xcode in order to get the current iOS SDKs, so installing on 10.6.3 would be pointless. Currently, Xamarin Studio (4.2) runs on OS X 10.7 and possibly as old as 10.6.8, but it has never been tested on anything older than 10.6.8 in the past 2 years of development. I have downloaded XamarinInstaller.exe and tried to install xamarin IDE for Windows XP by double clicking it. A pop up window did come out and I clicked on Continue button thereon. Next nothing happened. I dont find it to be installed!! Please help. Have you got any good solutions to the problem? If you go to the URL I mention in my post above, you can download the individual installers. That might work better for you. how to downlaod 4.0.12 version of xamarin.please give url of download. Why do you want to use such an old version? It seems to show 5 or 6 latest version. I can't renew for now and the problem is I can't find anywhere the last iOS version I can download and install with my subscription. If you don't see a version in the Xamarin.iOS dropdown that you are looking for, you should probably send an email to [email protected] We keep an archive of all past releases, so the support team should be able to get you any past release that you desire - even if you aren't able to renew (I'm pretty sure that when you buy a Xamarin license for a product, that you are at least entitled to any release made during the time period you had a license). Perhaps you can suggest to the support team that the web interface provide more options as well, for people in the same sort of situation that you are in. Good luck and I hope my suggestion is helpful. How I can download the version 4.10.01073 Xamarin.Android for Visual Studio 2010? Please give me a URL to download. Thanks for advance. If you don't see the version you are looking for on the website, there's nothing I can do for you. You'll have to email [email protected] and ask. I'm not sure what you are asking. If you don't want to run the 5.1 Alpha, you can switch back to the 5.0.1 stable version by simply switching to the Stable update channel. I currently have an IOS Business plan and would like to start testing and using Android. Is there a way I can install the Free Starter Addition along side my Business edition so I can test Android? Or is there a way I can install different versions on the same MacBook? @PaulKelly the Xamarin.Android installer and Xamarin.iOS installer are separate on Mac (though the main installer from xamarin.com downloads and installs both of them by default). If you install XA but don't have an XA license, it will behave as Starter. Your XI license won't affect XA at all. hi sir, can u give me a link to the previous xamarin version 3.1, please. @mhutch The title on XStudio 5.3 release notes page refers to XStudio 5.2. It'd be nice to have an option to pick beta versions as well, not only stable ones. It seems i need to go all the way back to 3.3.47 to not get the datetime.now bugg (http://forums.xamarin.com/discussion/25093/dst-daylightsavingtime-issue-for-datetime-now). This is not in the list (only goes back to 9th of september). How to get those easily? I have already mailed support, but not heard back. Because the "new" versions aren't any good. For instance, you removed "Deploy to Web" somewhere around 5.1. Every version after that is basically garbage for our needs. Where do we find the archived versions? On the Mac OS, you can install Xamarin.Android and Xamarin.iOS separately, allowing you to freeze the version of one platform while updating the other. 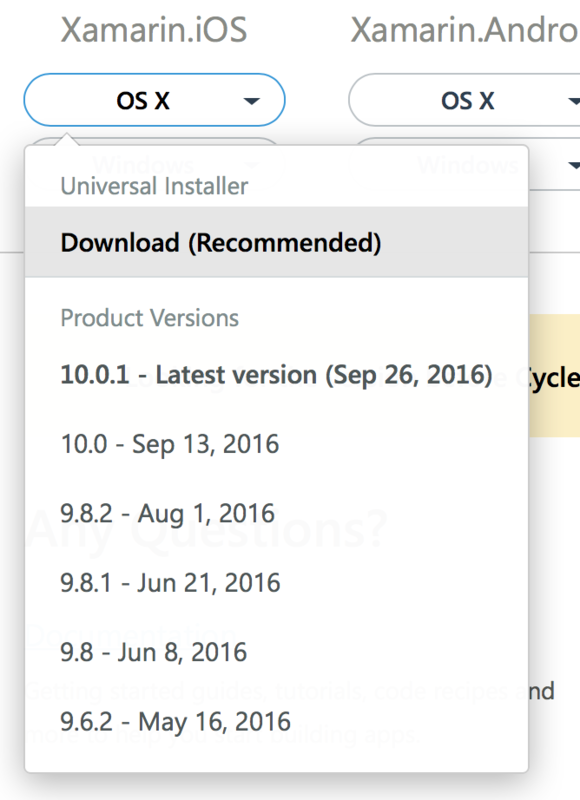 On Windows, it appears that one installer installs both Xamarin.Android and Xamarin.iOS, which means that if you want to update one, you have to update both (or if you want to downgrade one, you have to downgrade both). Is there a way around this on Windows? @nick5454 You'll have to contact [email protected] and ask them for a specific version (they'll have links to the archives). @Bosco I don't know. I think on Windows, the Visual Studio plugins are a combined plugin, so possibly not. You could ask [email protected] and they can get you a more definite answer. I understand this is an old discussion thread, but it's the most relevant one. We found the recent update to Xamarin 5.9.7 causes an issue with code signing. We need to rollback to an older version of Xamarin platform. Form my account's download page, I only see older versions of Xamarin Studio, but not the entire platform (no other components such as Xamarin.iOS or Xamarin.Android). What we need is a complete platform installation package for a previous version. Where can I get it? @richardgrant Ouch. That is quite an old version. Unfortunately I think you are out of luck. I'm sure we have some older versions of our products that will work on that version of OS X, but they won't do you much good because they'll only support really old versions of iOS and/or Android and at least in the case of iOS, you won't be able to submit to the App Store because Apple will only accept builds using the latest version of Xcode (which is also not supported on OS X 10.6.8). I think it is very incredible that it is not possible to find separated components of the Xamarin tools (like Xamarin Studio stand alone or Xamarin Android Player stand alone) for older versions. I am getting crazy trying to find the versions that I need, and I am starting to think that this is not possible. At our company we have had a problem with newer version which could not be fixed and we decided to stitch to an older version of the framework, the IDE and so on. Please make the fruition of such resources possible and easy to find. 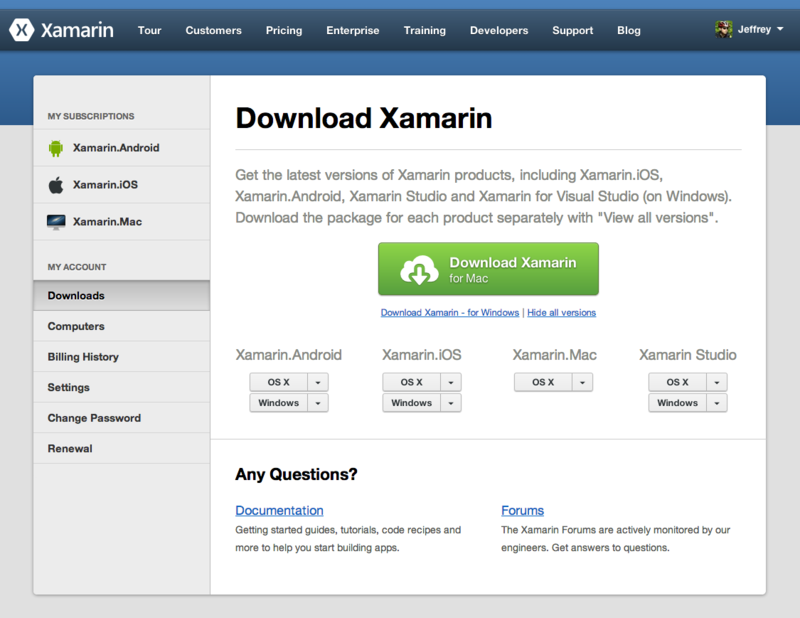 I need to download the Xamarin 6.0.2 but I don't find it. Go to https://store.xamarin.com, login, click on your name in the upper-right corner, select "Install" from the drop-down menu, and then you'll see each of our products. In the Xamarin Studio section, select the version you want. I was looking for Xamarin.iOS 9.4.0.0 and Xamarin.Droid 6.0.0.34 for OS X, does anyone know where I can find them? They don't appear in the Downloads page, so I tried "guessing" their download links but had no success. In case I have to contact support in order to obtain the download links, how can I do that? My subscription in indie. The list for me ends at 6.0, but I need 5.10.3.
but that link refers to nothing. However the April 6 version also 6.3 does exist. can it run in visual studio 2010 ? I need to install xamarin on osx 10.9.5 . I couldn't get any link listed above working. Any tip ? Forgot to mention, I paid for xamarin university do I need to purchase any license to use xamarin on osx 10.9.5 ?